There are breads that are meant to fade into the background, to serve as vessels for their toppings only. Some privilege texture over flavor, with an almost melting crumb, chameleon-like in their ability to absorb the flavors with which they come in contact. Like a person who never disagrees and is endlessly easy to get along with. I love those breads. 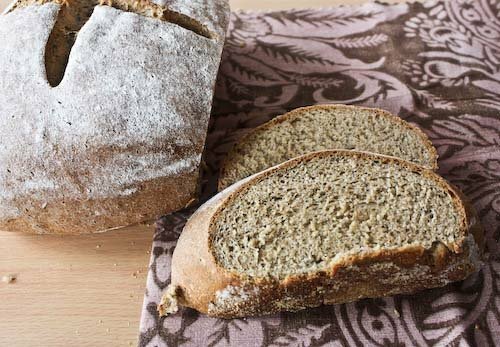 The peasant breads perfect for sandwiches, even as a base for soups. This is not such a bread. Not nearly so polite, it would never be satisfied to agree for the sake of agreeing. But it is intoxicating. It barely needs any adornments at all. And it is certainly not going to ask your forgiveness if its flavor is overpowering. This sort of bread is a thrill to be around, but in spurts. It won't become your standard, never your closest friend, but a once-in-a-while exhilarating companion. In your mixing bowl, stir together the yeast and milk and allow the yeast to proof for about 5 minutes. With a paddle attachment, stir in the salt, oil and unbleached flour and beat with a mixer for 2 minutes. Beat in the whole wheat flour, seeds and spices. Then beat in the rye by the half-cup. Allow the dough to rest for 5 minutes then switch to the dough hook. It's best to work with this bread in a mixer because the dough is extremely sticky. Kneed the dough in the mixer for 10 minutes. You will probably need to add additional flour for the dough to form a ball around the dough hook. My dough never actually released from the bottom of the mixing bowl, but it did eventually form a ball after the addition of quite a bit more flour. Oil a large bowl and place the dough inside. Turn the dough around so that the top is oiled (this will also help relieve some of the stickiness) and pat the top down to form a smooth surface. Cover the bowl with plastic wrap and then with a damp towel and allow the dough to rise until doubled in size, about 1:30 - 1:45 hours. Punch the dough down and knead out the bubbles. Oil the bowl again, add the dough, and turn it over so that it is well oiled. Allow to rise as before, and for about the same amount of time. Punch the dough down again and knead out the bubbles. As you do so, form the dough into a ball and pinch the bottom seam closed. Oil a heavy baking sheet, sprinkle with cornmeal and put the dough on it. Brush the dough with additional oil, cover sort of thickly with flour and then cover with a dry towel. Let rise as before, only this time it should take about 1 hour. After about 50 minutes, when the dough has almost doubled in size, preheat the oven to 450. Use a sharp blade or knife to slash the top of the dough. Spritz your oven (ceiling, floor, all walls) with water. Place the baking sheet in the oven, and spritz the dough and the entire oven one more time with water. For the first 15 minutes of baking, spray the dough and the oven with water every 3 minutes for a total of 4 times. After 15 minutes, reduce the heat to 350 and bake for 15 minutes more. The bread should sound hollow when tapped. Remove from the oven and cool on a rack before slicing. * You can use any type of milk you wish, including non-dairy and low fat. * At first, I was a bit concerned by how sticky the dough was, but the multiple oilings really help to calm it down. Don't be afraid to add more flour as you mix until it begins to form a ball, but know that more flour equals a heavier bread (not necessarily a bad thing). I'm sending this over to Susan at Wild Yeast for her weekly YeastSpotting! Aren't you the person who says she is afraid to bake?? This is gorgeous and not easy my friend. Great job! What a great looking combination of spices! Your blog is number one..
Dana, yes, that's me! But I'm determined to make bread. Thanks for your encouragement! Bensbaby, spicy is right! Lucky for me, my fiance loves all things spicy. Hila, well I'm not a PhD yet, but I'm working on it! Thanks for your kind words! Damak Tadi, ha ha, thank you so much! This one looks so yummy! This is a really gorgeous bread! 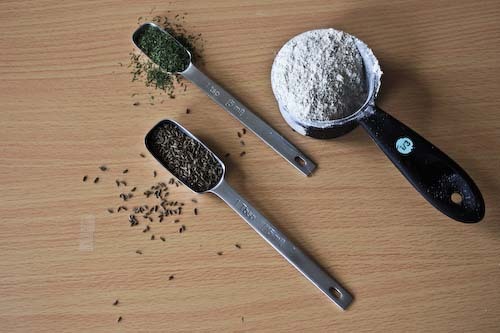 I love cooking with caraway, not many recipes call for it. I can see how this would have a wonderful assertive flavor. 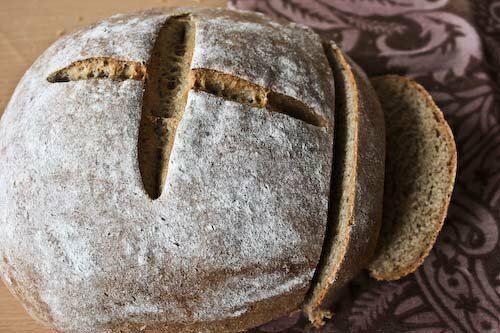 I love your description of it and the loaf is gorgeous! Sara, thanks! I've been known to focus on the dessert type posts on Tastespotting as well, even if I rarely make dessert! Miss Marie, I promise, it's nothing to be afraid of. I just started myself and have grown to really enjoy it. Jackie, thanks, it was very flavorful. Sara, how true, which is why my jar is barely used! Susan and Mimi, thank you so much!